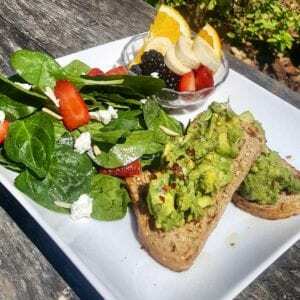 Delighting long-time customers and food-lovers who are just discovering this Pacific Grove gem, Crema has expanded its delicious brunch menu and is serving up decadent breakfast items all-day, seven days a week. Chef Tamie Aceves—owner of Crema in Pacific Grove anda busy catering business—grew up in Salinas with a grandmother who was constantly canning, cooking and baking and a grandfather who made his own salami, Kahlua, biscotti and cured olives. “They inspired me and I always wanted to be in the kitchen helping,” says Aceves. Her first food memory is going to her grandparents’ house on Saturday mornings with her brother to eat fried sourdough bread rolled in cinnamon sugar while watching cartoons. She can still recall how the house filled with those tantalizing aromas. Her Mom, too, is a great cook and always baked from scratch. Tamie grew up hearing “Mangia! Mangia!” all the time, so it’s little wonder she dedicated her life to food. “I was so jealous of the kids with Hostess snacks. . .all I got was killer homemade muffins!” she says with a wry smile. The first part of her career was front of the house, but when her son got into high school, he played lacrosse and football and she ended up doing a lot of team dinners, cooking for all those big hungry boys. “Saturday mornings they would come to the house and have my bacon cheddar biscuits and sausage gravy and they would always tell me I should open a restaurant,” she recalls. And that’s just what she did. Crema, founded in 2012, was the result of her need for a commercial kitchen for her catering company, La Crème. She fell in love with the charming building in Pacific Grove and knew it was perfect. Initially, she thought to hold events there, but it actually debuted as an Espresso Bar with baked goods, all made from her recipes. “We named the restaurant Crema, because it is the thick creamy part on the top of a well-pulled espresso shot,” she explains. 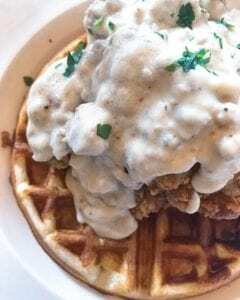 Eventually, a brunch menu was built around those bacon cheddar biscuits and her most excellent sausage gravy, for which she goes through 60 pounds of pork sausage per week from Grove Market. “It’s sooooo good!” she says. As the exclusive caterer for The Holly Farm, a destination wedding venue in Carmel Valley, Aceves is always busy. “On any given weekend, we are doing between two to six events for the same wedding party and they all have to be unique,” she says. Her high-energy personality is beautifully suited to the creative process of constantly inventing new menus for special events, some themed, like Chicken and Waffles Hangover Brunch. With business booming, she had to find a bigger kitchen in Pacific Grove and she’s really happy to have an awesome new chef, Hollie Jackson, on board. Being wrapped up with La Crème, Aceves spends little time at Crema, but she has a fabulous team to run the show there and thinks constantly about new items to offer, like her grandmother’s apricot raisin focaccia which she is working to re-create. 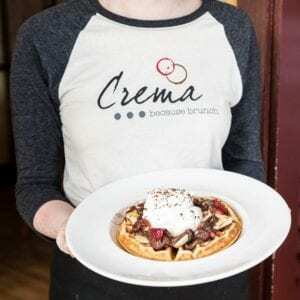 Crema just rolled out an updated brunch menu with more choices of both food and beverages, including lots more “adult beverages,” like tequila sunrises, French 75s, Irish Coffee, Greyhounds and Sea Breezes. New also are Verve Coffee cold brews and thirst-quenchers on tap. The #Cremlins—as the servers’ tee-shirts proclaim—are now serving brunch 7 days a week from 8am to 2pm. The expanded menu includes new sandwiches—BLTA, avocado toast, chicken salad on croissant—plus buttermilk fried chicken strips, crab cakes and eggs, six varieties of eggs benedict and Crema fries, including garlic, chile verde and breakfast versions. Naturally, Tamie has something else up her well-floured sleeve. She’s planning to add a fast-casual, beach vibe restaurant at the location of the current catering kitchen. Timing? She hopes for a tentative April 2019 launch. But for now, head to Crema for those bacon cheddar biscuits and addictive papas poblanos, so perfect with a Spicy Bacon Bloody Mary made with Absolut pepper vodka. Seriously, is there anything better than the brunch life?